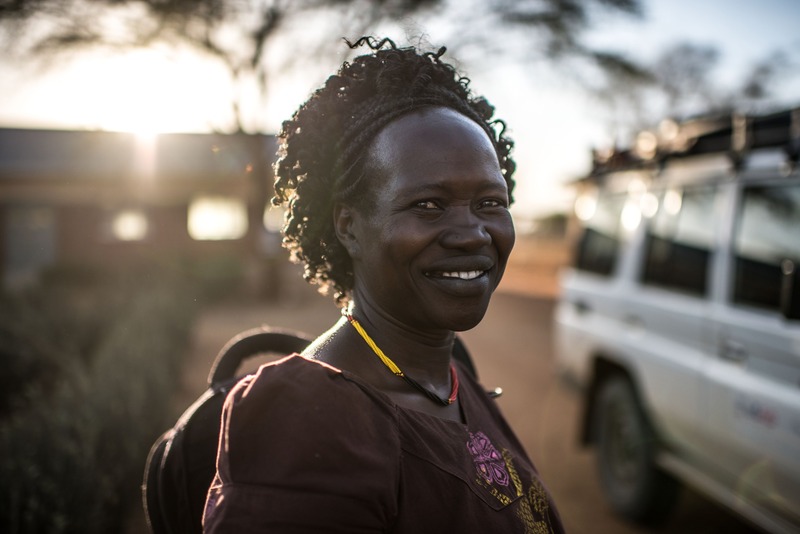 Kim, a village health team (VHT) worker, returns to the health center where her team is based after a busy day in parishes surrounding Moroto, Uganda. Photo by Tommy Trenchard for IntraHealth International. Until now, many of Uganda’s 180,000 community health workers have gone unaccounted for in the formal health system. Who are they? What services are they providing, and who trained them? The Uganda Ministry of Health is using a new registry—developed using IntraHealth International’s open source iHRIS software—to find out. The registry tracks critical personnel data that answer these questions, and its implementation is one of the first steps in a national plan to transform and professionalize Uganda’s community-based health workforce. With funding from UNICEF and the Korea International Cooperation Agency, IntraHealth worked closely with the One Million Community Health Workers Campaign, UNICEF, and Uganda’s Ministry of Health to develop the system. Uganda's community health workers are a crucial link to health care at the household level. So far, Uganda has implemented the registry in 11 districts and integrated it with the government’s HRIS portal. Now the Ministry of Health is working with IntraHealth and others to roll it out across the whole country. The registry provides health officials with the data they need to understand the size and scope of the existing community health workforce and to integrate these workers into the health system, while accounting for their contributions to health outcomes. It produces insights on workforce density and distribution, performance, incentives, training, and more, which will help the ministry standardize the practice of community-based health care going forward. Historically, Uganda’s community health workers have been trained and deployed by disparate projects and funders. They’ve been given a wide range of responsibilities with little supervision and inconsistent incentives. Their practice is not regulated, and there are no formal systems to train and manage them or account for the services they provide. But they are a crucial link to health care at the household level, especially in a country where 70% of doctors and 40% of nurses live in urban areas—among just 12% of the population. Groups of community health workers called village health teams (VHTs), supervised by level-two health centers, for example, helped increase child vaccination coverage from 48% to 73% in one region between 2006-2016. And others called expert clients and linkage facilitators serve as primary providers of HIV services. These groups are at the forefront of Uganda’s new community health strategy. To make more essential services available closer to communities, the Ministry of Health is creating a new paid cadre of providers called community health extension workers (CHEWs), who will work with and supervise existing VHTs and other types of volunteer health workers. Uganda expects to train 15,000 CHEWS over the next five years. The Ugandan government will begin recruiting and training approximately 1,500 CHEWs from 13 districts in the next few months, and expects to train 15,000 over the next five years. The new registry will help officials quickly identify and recruit existing VHTs who meet minimum education requirements into the formal six-month CHEW training. IntraHealth’s SHRH activity is now working with ministry officials to develop scopes of practice for different types of CHEWs and future financing strategies to sustain the investment in this new frontline cadre. The US Agency for International Development-funded Strengthening Human Resources for Health in Uganda Activity works to improve health care and health outcomes nationally by addressing performance and management problems, low retention, and skills gaps that affect the health workforce. IntraHealth worked closely with the One Million Community Health Workers Campaign, UNICEF, and Uganda’s Ministry of Health to develop the CHW registry, with funding from UNICEF and the Korea International Cooperation Agency, .